Evil Mad Scientist’s Lenore Edman will be talking out her robotic Snap-O-Latern and cylon pumpkins. The Snap-O-Lantern is a robotic mini-pumpkin. Normally, it just sits there, in disguise as a boring old pumpkin. But, every twenty seconds he comes to life. His LED eyes turn on, his jaw slowly opens, and then snaps shut– and he goes back into stealth mode. Evil Mad Scientist a small, family-owned company based in Sunnyvale, Calif. that produces DIY and open source hardware designs that originated on the Evil Mad Scientist Laboratories blog. 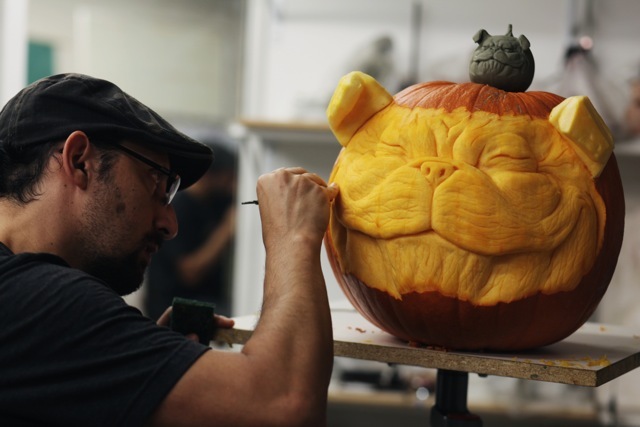 Alfred Paredes is a character designer and sculptor who works in several in mediums—including pumpkins. He also works as a designer for the collectibles and FX industry. Here is a slide show of his amazing pumpkin carving. MAKE’s own multi-talented Karlee Vincent will show off one of her pumpkin sculptures and several Halloween edible treats. Join us on MAKE’s Google+ page and tune each Thursday this month at 5pm PT/8pm ET for more Halloween projects and fun.